Taska Precious Steps subscribes to the Starlight Education Program. The program has been founded by Ms. Tabitha Yoo with more than 20 years of teaching, delivering, developing and planning curriculum & training. Ms. Yoo received her HNC Childcare & Education from Scotland and a Dip (Ldn) Montessori. Developed by Dr Maria Montessori. Developed the system to educate “unhappy” little ones and the “uneducatable” and applied to “normal” children. The Montessori method provides an environment for learning. Children learn at a pace they are comfortable and avoid wrong habits at a young age. The focus is on quality rather than quantity. Young children have an acute listening ability making them suited to pick up languages (English, Mandarin, Bahasa). At TPS character recognition and phonics form an important part of the program. The language program integrates school and home practice. The language program involves listening, pronunciation, recognition and writing (strokes for Mandarin). We follow a progressive reader series, basic levels introduces words through simple stories and advanced levels for complex words. We follow a US based program developed to enable people achieve their full potential. The four step program includes definition, illustration, application and affirmation. Lessons follow a theme, eg. birds and insects. The lessons include project work that encourages discussion and sharing of ideas and observation. Field trips enforce the classroom discussion. 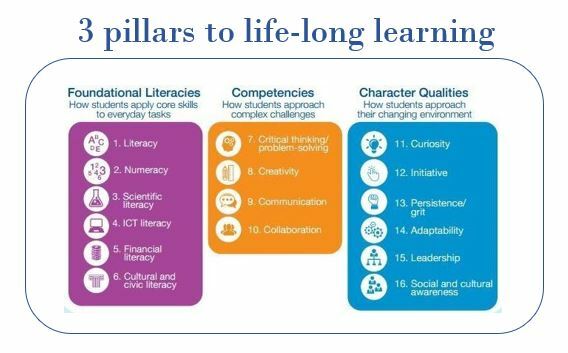 Foundational Literacies: This include languages, numbers, science and technology. Competencies: Critical thinking skills, creativity, communication (articulation of a problem/solution) and creating an environment of collaboration for everyone to succeed. Character Qualities: Persistence, integrity, honesty, leadership are key qualities of a leader. Many students eventually take up leadership roles in Primary school. Key areas of child development are assessed twice a year. Once in May, and the other in Nov. The assessment is made up of observations based on key developmental areas: motor (minor and major), language (understanding and spoken), emotional, creative, character development, etc. The results are held in a Learning Management System for senior staff to make reviews against target plans for the child.